Scott Hinkle is moving to administration. The boys head basketball coach of the past four years was approved by the board Monday night to be a new assistant principal at LHS. This leaves an opening for the head boys basketball coaching job at LHS. Hinkle led the Redskins to an 18-3 WAC championship season this year. They were 17-6 in 16′ after winning the WAC and making state. He also went 13-8 in 15′, 6-15 in 14′, 15-7 and to state in 97′, 13-10 and to state in 98′, and 9-12 in 99′. He was 91-61 overall with three trips to state and two conference titles. 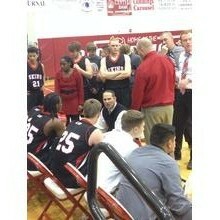 Before taking the basketball job, Hinkle was athletic director at LHS for nine years. He was an assistant coach at Seward for Jim Littell in 2002 when the Lady Saints won the NJCAA title.